Buyers chasing weight-for-age were not disappointed at the Hamilton weaner sale, with prices hitting a top of $1319 for whiteface steers. Hamilton Independent Agents yarded 1492 Hereford and Hereford-cross autumn 2017 drop steers, weighing an average of 338kg, on Wednesday, January 10. Cattle were booked to Princess Royal Station, T.B. White & Sons, Landmark Leongatha, Colin Say & Co, Elders Heywood, Southern Grampians Livestock, Elders Holbrook, Miller Whan & John, JBS Australia and LMB Livestock. Buyers were greeted with some of the heaviest whiteface weaners offered so far on the sales circuit, with much of the opening run weighing over 400kg. The buying charge was led by Wellington agronomist Paul Mason, who finishes Herefords for JBS Australia’s Great Southern grassfed brand. He paid 318-331c/kg or $1065-$1275 for 359 steers weighing 335-396kg. The equal heaviest pen of the day at 431kg was the sale topper on a dollars per head basis, with vendor Lochredal selling Yarram Park blood steers, EU accredited, for $1319 or 306c/kg to Princess Royal, SA. A second pen weighing 431kg opened the sale for vendors Leon and Sally Wheeler, Wallacedale. Their Yarram Park and Mawarra blood EU accredited steers sold for $1297 or 301c/kg, also to Princess Royal. Hereford steers weighing over 350kg sold for 283-331c/kg or $1030-$1319 – a fall of 4c/kg on the previous day’s Hamilton weaner sale. Steers weighing 250-350kg were $5 a head stronger to finish at $845-$1105 or 290-319c/kg while lighter types under 250kg settled at 306-320c/kg or $446-$798. A small offering of Hereford-cross steers made 290-297c/kg or $1061-$1252, EU accredited pens finished at $933-$1319 or 296-331c/kg, and there was a single Black Baldy pen at 306c/kg. Hamilton steer finisher Tim Hutton, “Nigretta”, judged the Herefords Australia champion pen, awarded to Bruce and Debbie Miller, Rowan, Carapook. Mr Hutton described the steers as being even and exhibiting great stretch. He also highly commended the Murndal steer weaners of vendor Marcus Winter-Cooke, Hamilton. The champion pen of 28 Yarram Park and Injemira blood calves was EU accredited and had been weaned for five weeks. They weighed an average of 375kg and sold for the sale equal top of 331c/kg or $1241 to steer finisher Paul Mason, Wellington, NSW. The highly commended Murndal pen were Yarram Park blood, EU accredited, weaned four weeks, weighed 413kg and sold to Landmark Leongatha for 310c/kg or $1280. Also topping the sale on a cents per kilogram basis was Farena with a pen of 26 Taronga blood steers weighing 241kg and making 331c/kg or $798 to Southern Grampians Livestock. Marc Greening, Injemira Beef Genetics, Book Book, NSW, continued his buying spree of steers for the grassfed program, Injemira Advantage. He paid 320c/kg for 347kg Bowmont blood steers from Kalenea, and 314c/kg for Injemira blood calves from Old Ripponhurst. Shad Bailey, Colin Say & Co, Glen Innes, was a major buyer in the middle run of calves for backgrounding in the New England, paying 290-321c/kg or $898-$1140. 1. 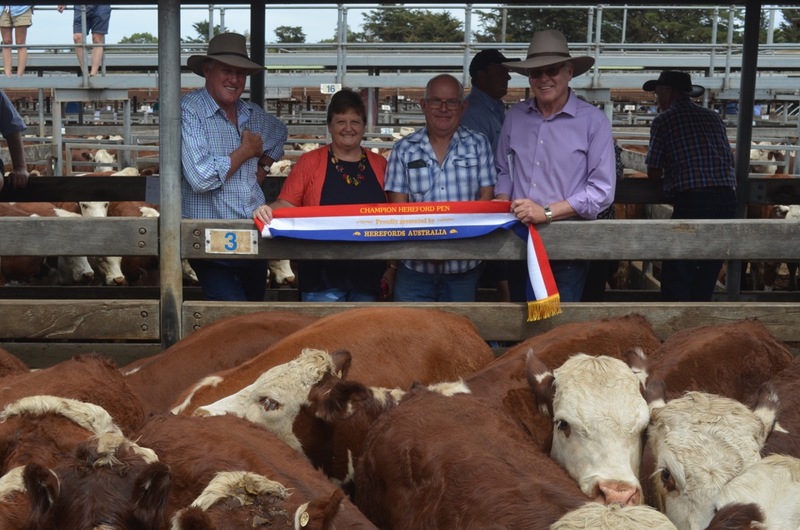 Bruce and Debbie Miller, Rowan, Carapook, and their champion pen of Hereford steers, with Herefords Australia chairman Bill Kee and judge Tim Hutton, Nigretta, Hamilton. Image Stock and Land. 2. 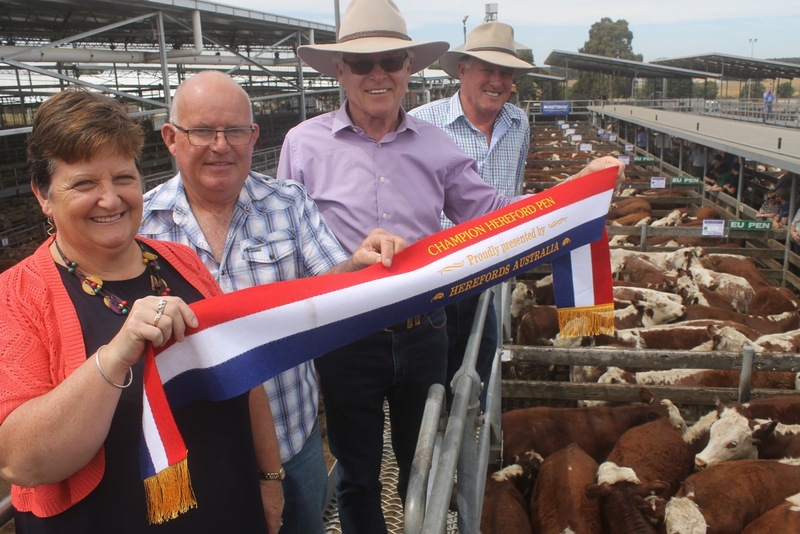 Judge Tim Hutton, Hamilton, Debbie and Bruce Miller, and Herefords Australia chairman Bill Kee with the champion Hereford pen of steers at Hamilton. Image Stock and Land. 3. 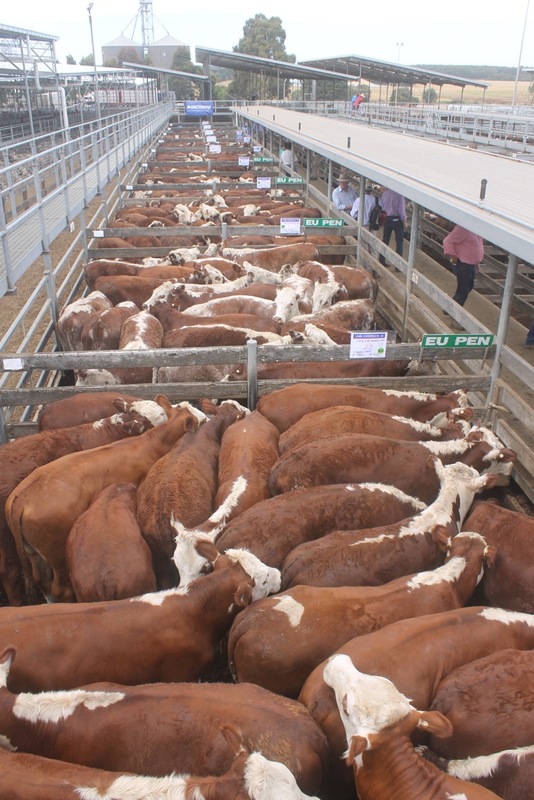 The opening run of Hereford and Hereford-Shorthorn steers sold for $1030-$1319 or 283-331c/kg at the Hamilton Independent Agents weaner sale.